An interview with Rhea Schwartz, the force behind the adult figure skating movement in the USA and beyond. 41 minutes, 51 seconds long. So I was really embarrassed. Now what am I going to do? So I went, and started taking this group lesson. And I loved it. And from the group lessons, I started taking semi-private lessons, and then private lessons. And I just got hooked. 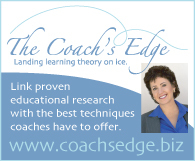 On skating coaches and adult skater students: The coaching world has had to adjust as well, and frankly the smart coaches realize that this is a good way to earn a living. 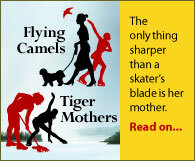 In the Washington area we have several wonderful coaches whose bread and butter is adult skaters. They have a stable of adult skaters to complement and supplement their kids who in relatively short order will be leaving for college. And the adults are there in lieu of it. We’re there for much, much longer than the kids are. And so I think the coaches are happier now to deal with adults. But it’s more challenging in many ways, both physically and mentally. Adults address skating in a different physical and psychological manner. We question everything, and we think about it. We think about it too much. You see this all the time on the rink. Some little kid is out there, and the coach says “put your left foot out first, and then take off”. Well, it’s going to take me a week to figure out how to put my left foot out first and then jump. You can’t just say to an adult “just do this” because it’s just not going to happen. But eventually we’ll get there! And usually there are lots of laughs in between, so that’s great. On how US Adult Nationals got started: I really was a thorn in the side of the USFSA. I kept going to the annual meeting and raising my hand, going “New business – to talk about adult skating”. And I think ultimately they just wanted me to go away. I wasn’t alone – there were some other people in the USFSA establishment, most noticeably Phyllis Howard [USFSA executive member], who got it. And ultimately just to get rid of me they created a developmental project for adult skating. Really, the way I think it was done, it was like “Okay, little girl, you go try this, and hopefully you’ll fall on your face and go away. But we will sanction a developmental competition, and let’s see what happens.”But it took five years of really hard hitting and just being relentless to get to that point. And then we engaged some good comrades, people who were willing to work on this for Phyllis and for adult skating. And as you know, the first Adult Nationals was in Delaware, and we thought we’d get 200 people if we were lucky. And we ended up with more than 400 people, and maybe twice that many starts, because so many people skated in different disciplines. On how the International Skating Union [ISU] adult competition got started: It was in many ways a repeat of the pattern with US figure skating. I became a thorn in Ottavio Cinquanta’s side, in a way. I would see him at world championships or other events and I would talk to him, manage to talk to him about adult skating. By that time I had already become chairman of the adult skating committee for US figure skating, so I had an entrée. And I was named one of the 25 most influential people in figure skating by International Figure Skating magazine, and Cinquanta of course was also one of the 25 named. So we were together at an event honoring the 25. Shortly thereafter Phyllis was president of the USFSA, so she had a further connection with Cinquanta. So that enabled us to begin a dialogue, which went on for several years. And then finally Cinquanta was willing to give it a try, I suspect that because he realized it was another market for the ISU. He was willing to think about skating as more than the elite competitors. And adults were ready, willing and able to be another constituency for him and the ISU. So persistence paid off [laughs]. And three years ago we had the first ISU-sanctioned adult competition which was held in Obertsdorf. And to his credit, Cinquanta was there from start to finish. He handed out every single medal, and spoke at the competitors’ final banquet. He couldn’t have been more gracious. And he realized, I believe, that this could be a very viable component of ISU skating.